It's long been thought that business intelligence (BI) could only be utilized by highly trained analysts and was therefore unattainable for most businesses. However, advancements in BI have made it so that everyone can utilize BI solutions to help shape business decisions and drive companies bottom lines. 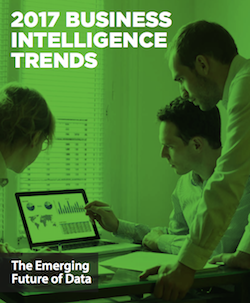 If you are interested in helping push your company forward, download and read our latest report 2017 Business Intelligence Trends.